Participants will be divided into groups, according to age and ability. Several sessions will be offered daily by experienced, qualified Lighthouse staff and/or guest speakers, introducing topics, such as; Assistive Technology, Keyboarding, Career Exploration, Orientation and Mobility, Braille/Reading, Home Management, Communication Skills, Low Vision and Recreational Activities. 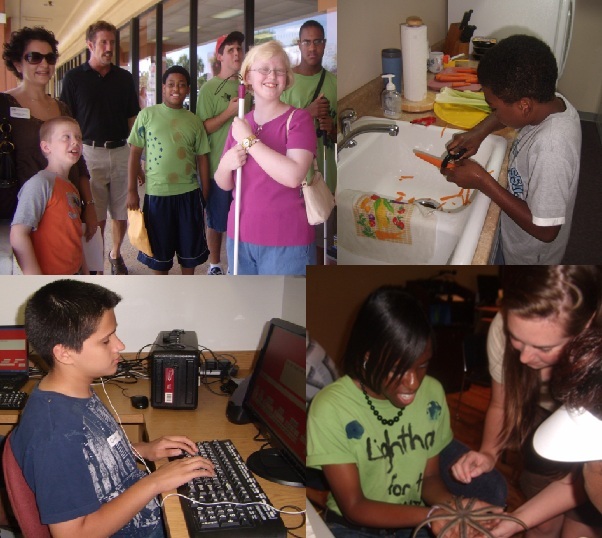 The Lighthouse staff and/or guest speakers will facilitate relevant, age appropriate activities for the participants. Techniques and adaptive devices will be demonstrated. Hands on methods will be made available to promote learning and awareness. Arts & Crafts, games and group activities will be implemented to foster the learning experience. • Field Trips and MUCH MORE!!! or click on this link to Donate Online Now! The Lighthouse thanks you in advance for your support! Please contact the Lighthouse to apply for Summer Camp. Space is limited and admittance is on a first come, first served basis.